The PA media similarly spins tales about every single stymied terrorist attacker of recent days – whether the attacker was killed to halt the killing spree or disabled in the act. In the PA even Ala’a Abu-Jamal was glorified as a martyr felled for no fault of his own out of capricious Israeli malice. 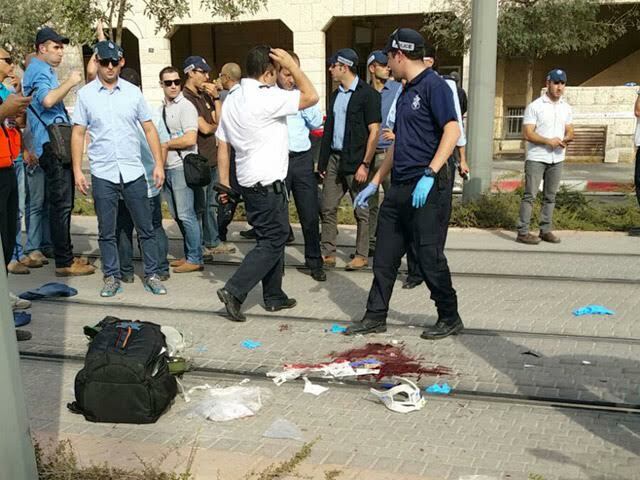 Abu-Jamal, the Bezek technician gainfully employed in Israel, used his company vehicle to ram into passengers at a Jerusalem bus stop and then proceeded to gruesomely hack them with an axe. He was shot to prevent him from taking more lives. In the isolated cases of Israelis attacking Arabs – i.e. Baruch Goldstein in 1994 and Eden Natan-Zada in 2005 – they were bludgeoned to death by local Arabs (Natan-Zada was then already arrested and bound). Yet the summary justice wasn’t condemned in Israel. It’s hypocritical that Arabs who confer rights upon themselves to extract vengeance even long after the original pretext – be it true or false – proscribe even lesser rights to Israelis. This constitutes one of the most galling aspects of the current spate of Arab homicidal assaults on Israeli civilians. The blatant and blanket denial to Israelis of the undeniably basic right to self-defense becomes the PA’s undisgued stratagem. Self-defense is defined as the inalienable right of an individual or a group to fight back during an imminent threat of bodily harm to oneself and likewise to others nearby while the threat is ongoing – especially in the case of an obvious deadly threat. This right is enshrined in law almost universally. It is born of an instinct to preserve and protect life. But in the eyes of all too many Arabs – especially in the PA and regrettably in the Arab sector inside within-the-Green-Line Israel – what is an elementary natural premise everywhere glaringly does not apply to Jews. The upshot are systematically fraudulent contentions that knife-wielding, gun-toting, rock-throwing or firebomb-lobbing assailants – who are brought down mid-attack – are actually hapless casualties of arbitrary Israeli villainy. Mind-blowing as this is to us, such impudent in-your-face distortions go over big abroad and are amplified by inimical opinion-molders who would never think to criticize French troops for terminating the Charlie Hebdo shooters but who apparently hold Israel to different standards. Arab and pro-Arab propagandists don’t shrink from any outright lie in the service of their inexorable efforts to blacken Israel’s image. But this isn’t merely an exercise in perverse PR. It’s an intentional stoking of the flames of so-called “anger” which is proclaimed as a license to kill Jews. In other words, this is incitement to mass-murder via deliberate calumny. Lies become part and parcel of the continuous indoctrination of Palestinian opinion – already inundated with deception and disinformation in the PA’s controlled media, its school system and the mosques under its aegis. Invariably this crosses the Green Line into Israel’s Arab sector where pretense of loyalty to the state has effectively disappeared. Misplaced liberality by successive Israeli governments and the Israeli judicial establishment have conferred a semi-legitimacy on a mega-scale manipulative mendacity within our own borders. Portraying the perpetrators of atrocities as martyred innocents is no less incendiary than the deceptive campaign alleging an Israeli conspiracy to change the status quo on Temple Mount, raze the mosques there and erect a Jewish shrine in their stead. Fabrications can cynically feature, in and of themselves, as lethal weapons of war. Kerry is once again backstabbing Israel…he is Abbas unshakeable ally. Kerry and his sorry boss are FULLY RESPONSIBLE for the Arab violence. After you take away the right to self-defense, there’s no such thing as “upping the ante.” The final line of defense-the right to life-is being breached, and its’ only a matter of time before this juggernaut of death takes on unstoppable proportions. The juggernaut will continue, because the lies and incitement won’t stop. Sealing off the neighborhoods the terrorists originate from is a step in the right direction, but will it be enough? Hopefully…but on balance maybe not. More aggressive actions should be planned, because if this cascading death-in-the-streets isn’t stopped, another large-scale war is inevitable. Does anyone else see how this is exactly the same behavior exhibited by drug addicts and alcoholics? Projection, Blame, Rationalization. . .